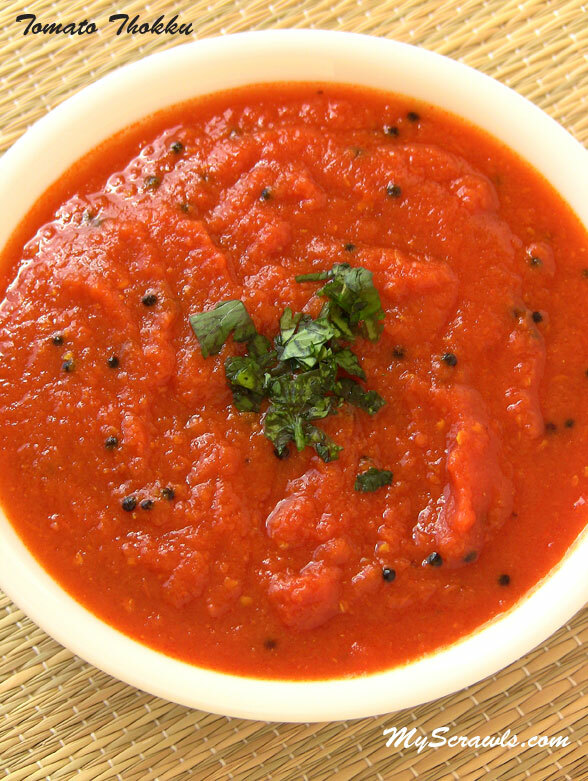 Thakkali (tomato) thokku goes perfectly well with idlis, dosas and even chappathi! If stored properly, it stays good for even one week. Unlike chutney, we add extra oil in this recipe. The oil acts as a preservative which helps to increase its shelf life. You can use any cooking oil but I would recommend sesame oil/gingelly oil (nallennai in tamil). Sesame oil brings out a distinct flavor and gives wonderful aroma to the recipe. The best part is we add about 1/2 tbsp of oil after thokku is prepared. 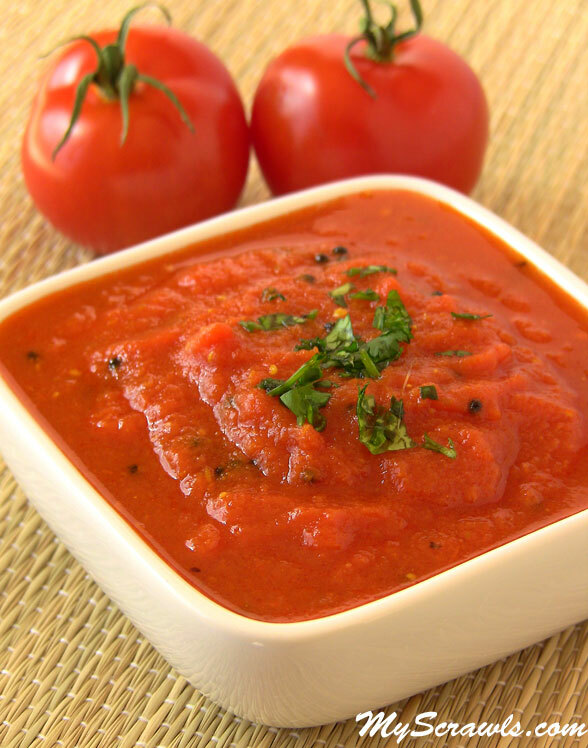 Raw oil blends well with the spicy tomato sauce and keeps it fresh for days together! Tomato thokku not only serves as a side dish to the tiffin items like ldli, dosa &chapathi, this thokku can also be mixed with hot rice to enjoy quick fix thakkali sadam (Tomato rice)! I just love the versatility of this dish and end up making it quite often! Grind chopped tomatoes along with garlic and green chilies and keep it aside. Heat 2.5 tbsp of oil and do seasoning with mustard seeds, curry leaves and asafetida. When mustard spatters, add the tomato mixture, chili powder, turmeric powder and salt. Allow the mixture to boil (about 12-15 min). As the mixture boils, it would slowly thicken. Keep stirring occasionally. You can see extra water (in the tomatoes) evaporating away and leaving behind the sauce. When you find thick sauce in the pan (25% of the original quantity), remove from the stove. Add the remaining oil and garnish with cilantro.